There are times in life that sparkle with significance! The birth of a child is one of those moments, a treasured chapter in your story of life. Humans have been marking this precious occasion through ceremony for many thousands of years. The diversity of ceremonies that have been performed around the miracle of conception and birth are endless. Body Art & Photography Baby Blessings are unique and personalised ceremonies of acknowledgment, gratitude and prayer between you and your child, in preparation for your child's first initiation of life. These ceremonies are conducted with care, compassion and colour. Starting with an initial consultation, you will be guided into the process of discovering which emotions, images, and feelings are present for you around being a mother. A spiritual map is created to facilitate the design of your Body Painting Art. Set in the comfort of your own home, with candles and the subtle scent of essential oils wafting over us, we sit in ceremony. Calling in the elements, our spirit guides, welcoming our amulets and talismans to the sacred prayer mat, cleansing the ether with burning sage, and ushering words from the heart to the little being growing inside. Listening and sensing all that is with great reverence. A shamanic experience that will leave you feeling wrapped in prayer. A final artwork that will be treasured for generations. "My husband and I both loved having Orly at our home to create this wonderful experience. I didn't want to wash my belly at all and managed to sleep very still overnight so I could enjoy looking at my beautiful belly the next day as well! The most amazing thing was watching baby move which was so much more visual with my beautiful belly art! Orly is an extremely talented artist with a passion for what she does and it was a privilege to have her bless our baby. We will treasure our pictures of her artwork always and look forward to sharing them with our child. Thank you Orly"
Take your time to consider all your questions & whether this amazing experience is right for you. Ready to book the date? 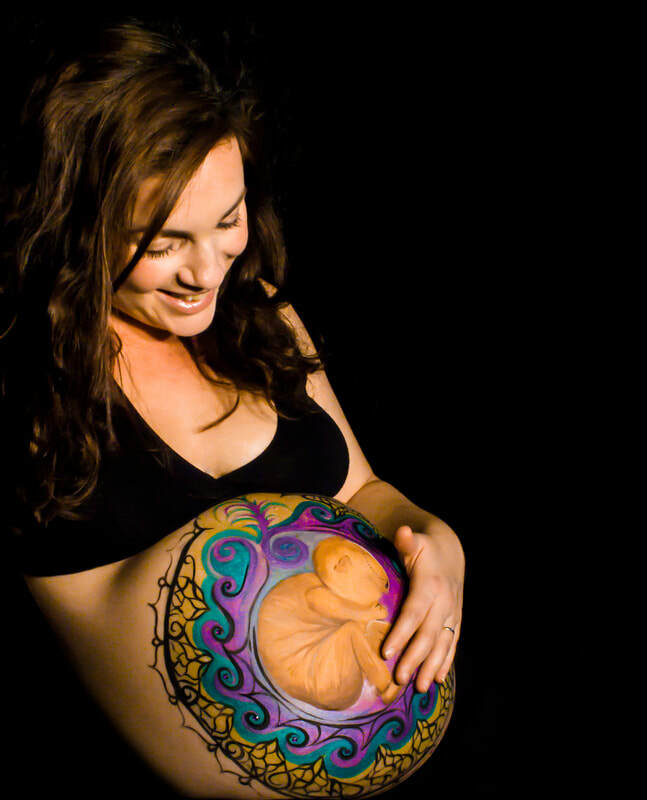 Pregnant Body Painting sessions are available until the 38th week only. "A friend of mine had her belly painted by Orly last year and after she saw how much I loved the photos and the concept, she bought a session for me when I fell pregnant. The whole experience was absolutely beautiful. Orly came to my home and created such a comfortable, warm atmosphere. I was a little concerned about how comfortable I would be sitting in one place for a couple of hours (at 8 months pregnant!) but it was actually so relaxing- Orly played music, brought cups of tea and I just sat back and enjoyed. The painting itself turned out to be stunning, and the photos are a beautiful memento. I highly recommend this experience for any woman wanting a really unique memento of her pregnancy experience"